Joint Hypermobility without symptoms, is a good condition to have and permits people to do well in the performing arts. Joint Hypermobility with symptoms, constitutes a disease, the Ehlers-Danlos Hypermobility Syndrome, also known as EDS type III or Joint Hypermobility Syndrome (JHS). Joint hypermobility indicates the presence of a genetic alteration of the collagen matrix of most tissues. These may distend giving sprains, subluxations, arthralgias; may dilate, producing varicose veins, aneurisms, dysautonomia, cysts; may rupture, producing hernias; may wear and tear, giving early osteoarthritis and osteoporosis. A.- Ehlers- Danlos Syndrome (EDS). 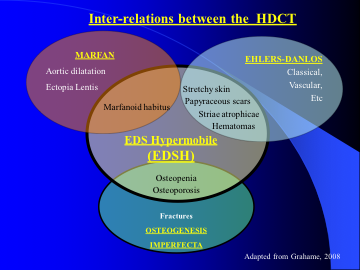 What are the Hereditary Diseases of the Connective Tissues (HDCT). HDCTs are diseases that can affect multiple organs and are due to alteration of the collagen (protein) caused by a genetic mutation, that can be hereditary or due to a “the novo mutation” (new mutation). Alteration of Collagen 1 (COL1A or 2) gives OI. Problems with Collagen II (COL2A) produces cartilage diseases and dysplasia’s. 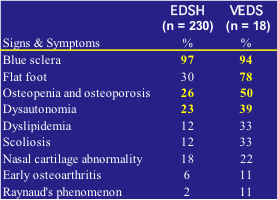 Alteration of collagen III can give EDSH or VEDS (COL3A1 or 2). Disorders of Collagen V (COL5A1) produces EDS I-II. Alteration of Fibrillin or Elastine can cause MFS. CEDS is one of the types of Ehlers-Danlos Syndrome that includes former EDS types I and II, very similar to EDSH, but characterized by extreme hypermobility, frequent subluxations and severe skin fragility. It is due to alteration of Collagen type V (mutation of the gene COL5A1) and has Dominant Autosomal inheritance. It is less frequent than EDS-III. The Classic form was the only one we knew years ago, pictures showing marked laxity of the skin of the face. CEDS photos. From Dr. Bravo. Excellent article about CEDS by doctors Malfait, Wenstrup and De Paepe. 2.- Hypermobility Ehlers-Danlos Syndrome (hEDS). EDS type III or Joint Hypermobility Syndrome (JHS). Preferably should be called hEDS. It is one of the HDCTs and is due to an alteration of the Collagen type III. The exact gene alteration is unknown, but it has been related to partial deficiency of Tenascin-X. It has Dominant Autosomic inheritance (half of the children will inherit it). It appears to be a forme fruste of the classic HDCT, since it has similar symptoms and signs of all of them, but with a lesser degree of severity. It is extremely frequent (40% of the Chilean population, as well as in the UK and probably in most countries if looked for), but usually not diagnosed. Frequent arthralgias, myalgias (muscle pains, at times similar to Fibromyalgia), recurrent tendinitis, bursitis, sprains, subluxations of joints, back pain, early osteoarthritis and early osteoporosis. Skin abnormalities, myopia, hernias, varicose veins, rectal prolapse, gastrointestinal reflux,inflammatory bowel disease, etc. Proprioceptive impairment (altered orientation of parts of the body, like position of the big toe, up or down, when examined). Autonomic dysfunction: (Dysautonomia, Xeroftalmia (dry eyes) and Xerostomia (dry mouth). Genetic link to depression, anxiety, panic crisis and phobias (Bulbena). Ref. Bravo JF, Wolff C. Arthritis & Rheumatism Feb. 2006.
n = number of patients or controls. The Beighton score (Bsc), Revised in 2017. It has been used for more than 30 years. The cut off point in children is 6/9, in adults 5/9 and in elderly, 4/9 . The Brighton criteria (BC), includes de Bsc. 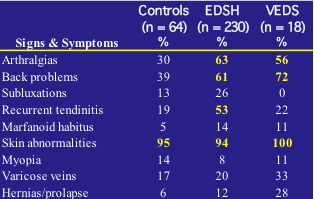 When the BCis positive is indicative of EDSH, unless there is an exclusion. Need to change the name of JHS. See Power point. We have found that physicians and the general public do not pay too much attention when we speak about “Joint Hypermobility Syndrome (JHS)”. It is felt as something curious, a circus act or a kind of children´s party tricks and not a potentially serious medical problem. For this reason we are convinced that a better name would be “Ehlers-Danlos Hypermobility (EDSH) or EDS type III”. Also because someone can have it without being hypermobile (Bsc 0/9 with positive BC Hereditary Diseases of the Connective Tissues. Slide collection. Dark skin sign in the joint extension surfaces in JHS: “dark elbows”, “dark fingers” and “dark knees”. “Hand holding the head” sign. Clinical study of hereditary disorders of connective tissues in a Chilean population. When considering the diagnosis of JHS. Poster. Clinical study of 972 JHS patients. VEDS is also one of the HDCT and is due to alteration of Collagen type III. The altered gene is the COL3A1. It has worse prognosis than EDSH, since it can produce arterial ruptures as well as organ ruptures (lung, arteries, colon, uterus). It can produce arrhythmias and even sudden death. Has Autosomal Dominant inheritance (half of the children will inherit it). Its frequency is now thought to be 1 in 50,000 to 100,000 people. Vascular Ehlers-Danlos criteria. The Villefranche criteria. Family history questions looking for VEDS. VEDS article by Melanie Pepin & Peter Byers. Typical Vascular EDS facial appearance. VEDS diagnostic confirmation. VEDS can be confirmed either with a Biochemical technique (skin biopsy) or by a Molecular genetic study (Blood sample). Both studies are done in specialized centers, such as Peter Byers MD, in Seattle, Washington. 4.- Kyphoscoliosis type EDS.Formerly EDS type VI. 5.-Arthrochalasia type EDS.Formerly included in EDS type VII (VII a). 6.-Dermatosparaxis type EDS.Formerly included in EDS type VII (VII b, c). MFS is another of the HDCTs, it is due to a genetic alteration of Fibrillin and Elastine. The altered gene is located in Chromosome 15 Locus 21. It is characterized by Marfanoid habitus with an arm span greater than the height. It is usually associated to dilatation or rupture of the aorta, Ectopia Lentis (lens subluxations) and Osteoporosis. Has Autosomic Dominant inheritance (50% of the children will inherit it) and affects 1 in about 12,000 people. OI is another of the HDCTs, it is due to an alteration of Collagen type I (COL1A or 2) and is characterized by blue sclerae , not always, and marked fracture tendency due to osteoporosis. Fractures can occur even in utero. It has usually Autosomic Dominant and occasionally Autosomic Recessive inheritance (both parents need to be affected). Affects 1 in 20,000 born alive children and 1 in 100,000 adults. There are 5 types as noted in the “Sillence classification”. The information in this web site is provided as a free public service. The information contained is for educational and informational purposes only, and is not intended to replace professional advice, whether medical or otherwise. Consult your own qualified physician or other health care professional regarding your individual needs.By retrieving and/or utilizing information from Jaime F. Bravo MD.’s web site, you agree to hold harmless Jaime F. Bravo MD. from any and all liability arising directly or indirectly from your use of information contained in the web site. .